This session alternates between low beta, alpha and theta frequencies, stimulating creativity but also keeping you awake and alert. 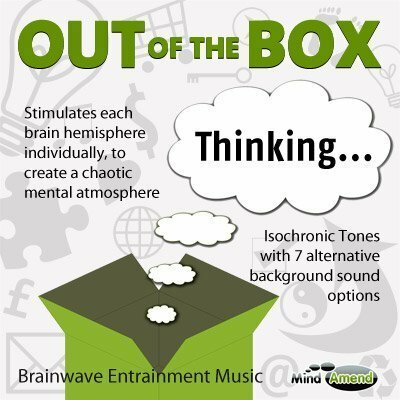 It attempts to steer you away from familiar thought patterns, helping you to Think Outside of the Box. The ‘Out Of The Box Thinking' session continuously jumps between frequencies very quickly and randomly. This can help to stimulate different memories, emotions, ideas and thought patterns. This session is quite manic, with the aim of breaking you out of a mental ‘box'. The concept behind it is to move your brain out of the usual well-trodden paths of thought. Our lives are full of routine and similar repetitive experiences. So when we try to come up with new ideas or inspirational thoughts, we often find ourselves thinking on along the same lines, so new ideas off the beaten path are hard to come up with.